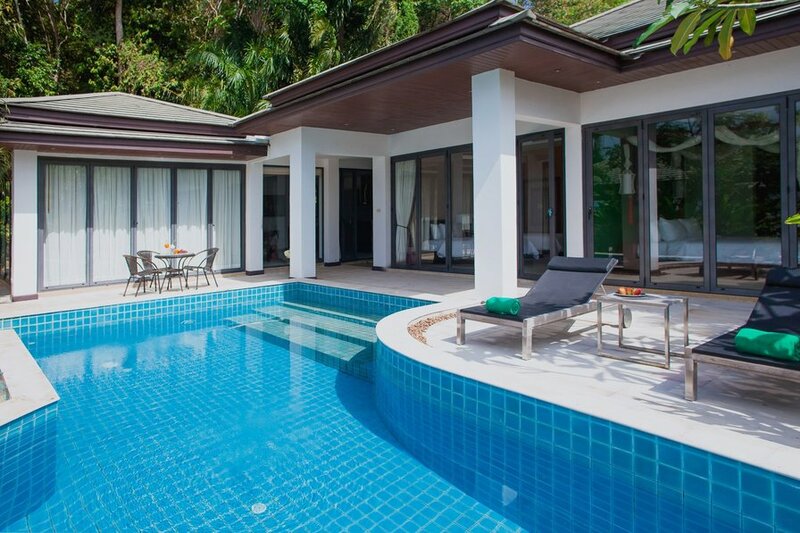 Baan Eng Fah Villa is located in the Klong Muang Beach area, the family friendly and upmarket resort area of Krabi, where most luxury resorts can be found, such as the Ritz-Carlton Phulay Bay, Dusit Thani and Sofitel. The Villa is set peacefully back from the main road, with access is up a private road on the hillside, offering amazing & beautiful views overlooking the clear blue waters of the Andaman Sea, whilst surrounded by the lush green mountains of the local National Park. Baan Eng Fah Villa is a place to relax and enjoy privacy away from the hustle and bustle of the other tourist areas, only 5 minutes from Klong Muang beach, restaurants, bars and shops. These Private Luxury Pool Villa is available as 2 bedrooms, ranging from 240 m2 of covered living space, with a private pool with sea views. The Villa is one storey boasting a modern spacious design, offering an open plan living/entertainment area, dining area and kitchen area. The kitchen is fully fitted and well equipped. There is free Wi-Fi throughout the Villa. All bedrooms are comfortably decorated offering a selection of King-size and twin bed, all en-suite with luxury bathrooms. Baan Eng Fah Villa is close to all the local attractions, including beaches, golf course, water sports and the local island group of Koh Hong. These islands can be reached by a short boat ride, either by the local Thai long tail boats or speed boat. On the islands you will find tropical beaches where you can sunbathe, swim & snorkel, or explore the wonders of a stunning blue lagoon in the middle of one of the islands during hide tide. In summary Baan Eng Fah Villa offer the best of what Krabi can offer, a peaceful & luxury setting, just a stone throw from all the local attractions.